France is the country of origin for the latest release from US-based Aagoo Records, due out on Friday, September 21. The label has announced this as a collaborative release together with Amsterdam-based label REV. Lab Records. The album ‘Una Volta’ will be released as a CD with an accompanying 32-page art book, created by artist Bas Mantel. Ahead of that release, PILES previewed the lead track ‘Drones and Piles’. ‘Una Volta’ is a knock-out record of eight drum sound compositions, revealing secrets of the universe that are written in light. Abstract instrumental, this collection of tracks was created by three friends who teamed up especially for this recording. PILES’ sound and their musical approach are intriguing, leaving you perked to see what comes next at every turn. No song here is like another and the genres on this album even tastefully vary, despite being entirely instrumental. PILES’ sound is a free fall into the universe of energetic beats, rhythm, dynamics, repetition of the unexpected. It is an adventure that reveals the hidden depths of their sound spectrum of acoustic drums. This music is recommended for fans of Neu!, Can, Trans Am, Hanged Up, Beak>, Captain Beefheart, Edgar Varese and This Heat. Standout tracks include Drones and Piles, Decay, Mort aux cons, and Ulrik, which is a fantastic track that leaves you wanting more than offered in these brief 2 minutes. Based in the French cities of Nancy and Avignon, PILES is comprised of Guigou Chevenier (Etron Fou Leloublan, Volapük), Anthony Laguerre (Filiamotsa, Club Cactus, Myotis), and Michel Deltruc (Isle-Adam 95, NAJA Nancy Jazz Action). In 2016, Chevenier had the idea for PILES to continue his musical work with experimental trio ‘Les Batteries’ between 1985 and 2000. This drum trio also involved British drummer Charles Hayward and American drummer Rick Brown. PILES’ three drummers have long and rich careers. PILES’ drumming is shaped by their individual musical roads by life, architecture, landscapes, nature, politics, film, art, dance and theater. By seeing and hearing the rhythm in all that surrounds us. Taking inspiration from kraut rock, free jazz and improv, they are also influenced by Can, Dave Grohl, Arvo Part, Drumbo (of Captain Beefheart), Robert Wyatt, Abe Cunningham, Jimmy Chamberlain, Jon Theodore, Joe Baron and many others. 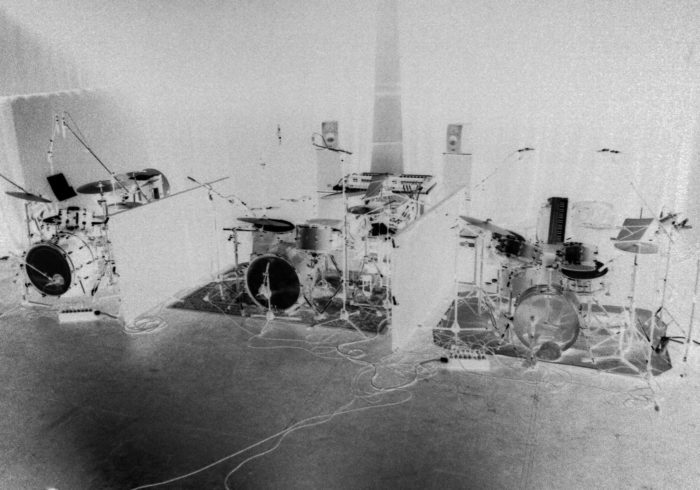 Like PILES’ drum-based sound, the graphic designs featured in the art book and video for ‘Drums and Wires’ are frightening, direct, loud/quiet, raw, layered, fragmentary, abstract and experimental. REV. Lab founder Bas Mantel felt PILES would be a perfect fit for the REV. Lab. series, released jointly with Aagoo Records. REV. Lab is a small independent music label, whose sound and tone is rooted in electronic, ambient, experimental, cinematic and abstract soundscapes. This series investigates the relation between the graphic translation of the music and its physical output. Aagoo Records is home to vinyl releases by Xiu Xiu, Phillip Petit, Eraldo Bernocchi & Chihei Hatakeyama, Lucky Dragons, Darto, CUP, connect_icut, and The Use. ‘Una Volta’ is a limited release of 300 copies, including a CD with book carefully packed in a semi-transparent glassine bag. As of September 21, it will be available via online stores and streaming platforms, but can already be ordered from Aagoo Records’ website and digitally via Bandcamp. You can follow developments with PILES on their Website and Facebook. Follow them on Soundcloud and Bandcamp too.